Oh how the time flies by when you are enjoying life! Shortly after Emma and Ash’s return to the UK I received the surprising but wonderful news that I am to become a Nana in November! Emma is going to have a baby! They hadn’t planned for it, having only just set a rough date for their wedding next year, but they are nonetheless thrilled to bits and I can hardly contain my own excitement! So it looks like I’ll be paying an early visit back to the UK this year – to see and be with my first grandchild! A week before the exhibition my good friends Paul and Sheila Vernier came to visit me with their daughter, Adele and Niece, Hannah. Paul kindly brought some more music CD’s for me and we spent a pleasant couple of hours exchanging all our news. Sadly they will miss my exhibition but we have made arrangements to meet up again when they return to Crete in September. Jenny finally got to see her commission, via email. 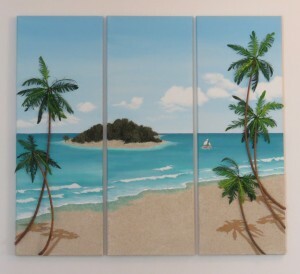 I really wanted her to see the picture hanging in her apartment, which is situated on the Harbour Front in Chania, but due to prior commitments she has been unable to visit Crete so far. The important thing though is that she loves the artwork and I am sure that she will be even more pleased when she sees it in situ and real life. As I have mentioned in a previous post – my mixed media artworks are better appreciated in real life rather than in photographs. David and I had our eighth exhibition in the Old Mosque on Chania Harbour Front and it was my most successful ever! When you take into consideration the fact that I have to increase my prices by as much as 25 per cent in order to cover the expensive costs for hiring out the Old Mosque – this is indeed good news. As with most things – people will only pay the price you are asking if they think it is worth it. Some customers bought not just one but several of my seashell mosaics and collages and I sold many of my larger and more expensive artworks. In addition, a local gallery owner came to the exhibition and wants me to contact his daughter who runs a gallery in London. He explained that they think they may have a market for my unique style of contemporary art. 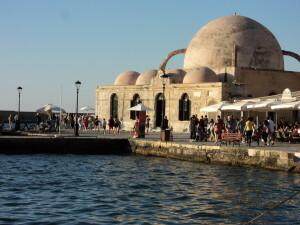 I thoroughly enjoyed the whole week we were in Chania, as I always do when we exhibit there. It’s such a pleasure to meet with old friends who make their living on the Harbour Front in all sorts of ways. Yianna, who sells tickets for the boat trips, Dimitri and Sira, who run the horse and carriages and even Roofer, who sells all the latest gadgets. Sometimes, when it was quiet in the afternoon David and I would just sit outside the Mosque and watch the world go by – literally! 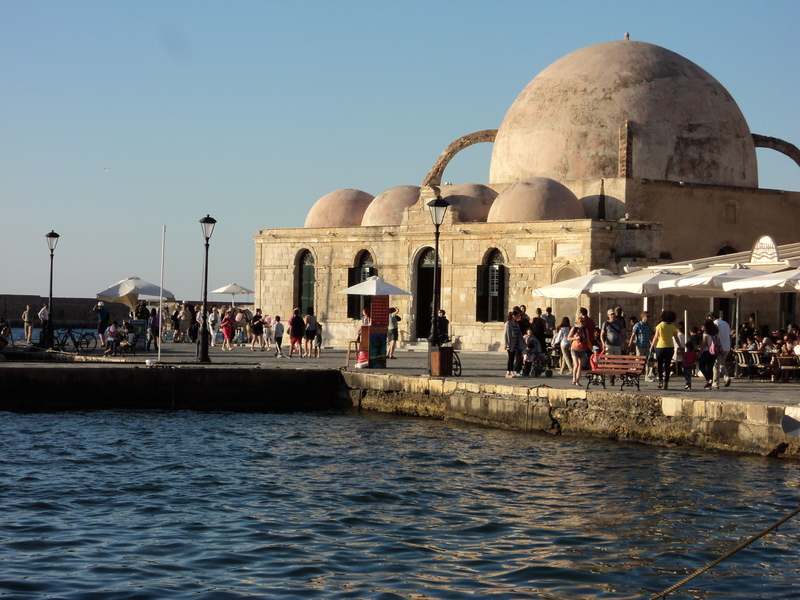 Chania is so cosmopolitan, boasting such a variety of worldwide visitors. All round – it’s just a wonderful place to have an art exhibition. This entry was posted in Blog Posts and tagged Chania, Mixed Media Contempoary Art, Seashell Mosaics by micmaryjo. Bookmark the permalink.